White Orchid Distinctive Floral Studio is an independently owned store located in the downtown Bloomington. Our specialty is a focus on unique designs, color and texture. Joanne Figuered , the owner, has 25 years of experience in the field. She is a graduate from Indiana University with Fine Arts degree. The shop itself has been part of the Bloomington community for 15 years. We encourage unique designs. We offer high level of customer care, all of our customers are equally important. No request is too large or too small. Flowers engage the senses. Color, fragrance, texture are the elements of a good bouquet which should be appropriate and memorable for the recipient. We make every effort to make sure that each and every delivery we make is a WOW. 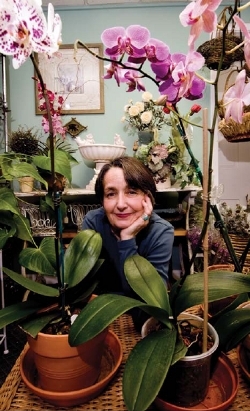 Article about us in Bloom Magazine "A Little Flower Shop Where a Big Dog Roams."